DOWNLOAD YOUR FREE HOLIDAY CARD TODAY! Did you know that CCR Tickets make great holiday gifts? And we make it even easier by offering you a downloadable holiday gift card to gift with those tickets. We've commissioned artist Travis Hanson to create a one of a kind custom holiday card just for the revolution. It's really simple, too. Just download the PDF, print it, fold it and fill out out. That's all there is to it. Click here to download your card. BLACK FRIDAY & CYBER MONDAY JOIN THE REVOLUTION - SAVE 15% OFF WEEKEND TICKETS! That's right! Our once a year Black Friday through Cyber Monday sale continues. Save 15% off all WEEKEND tickets when you use code SAVE15 at checkout. Don't waste any time as the sale ends at 11:59pm on Monday November 26th! TONS OF GREAT COMIC GUESTS ADDED FOR CCR CHICAGO! To see our full current guest list click here or to get tickets click here! We excited to announce our initial guests for Comic Con Revolution Chicago (CCR CHI). The inaugural show will take place June 1st & 2nd 2019 at The Donald E. Stephens Convention Center in Rosemont, IL. Tickets go on sale today, Wednesday, September 5th, 2018. Order your tickets to Comic Con Revolution today. Early bird pricing will be available until December 31, 2018. Early bird pricing is as follows: Adult weekend tickets are $40, Teen weekend tickets (13-17) are $30, Adult Saturday tickets are $25, Teen Saturday tickets (13-17) are $18.75, Adult Sunday tickets are $20 and Teen Sunday tickets (13-17) are $15. As always, kids aged 12 & under are free with the purchase of an adult ticket. Tickets purchased at the door will be $5 more per ticket. In addition to the savings, advanced ticket holders will receive a limited edition art print, as well as being able to enter the exhibit floor an hour early each day. A HEARTFELT THANK YOU TO THE INLAND EMPIRE! When we decided to do our first convention as Atomic Crush Events and to debut Comic Con Revolution in Ontario we hoped the fans would enjoy it. Never in our wildest dreams did we expect to be embraced by the community the way we were - attendees, exhibitors & guests alike. We are humbled by your support and by all the smiling faces we saw last Saturday. We look forward to the day we can be 909 again, even if only for the weekend. 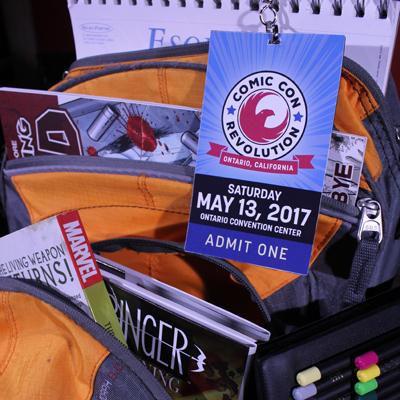 So mark your calendars, tell your friends and start preparing for May 19 & 20, 2018 when Comic Con Revolution returns! Gabe, Drew, James, Mike & the rest of the CCR Team! COMIC CON REVOLUTION INVADES ONTARIO SATURDAY! After months of hard work the time has arrived! Comic Con Revolution comes to the Inland Empire this SATURDAY at the Ontario Convention Center! Here's a quick rundown of what we have in store for the show Saturday. We open at 10:00am on Saturday May 13th. If you purchased a ticket in advance (online or at your local comic shop) you can get in at 9:30am. We will start checking in advance ticket holders at 7:30am -- if you want to get in when doors open at 9:30am we suggest arriving early and checking in at the Advance Ticket counters in the lobby. At 9:15am we will have an opening ceremony presided over by Ontario Mayor Paul Leon. Afterwhich the doors to the revolution will be flung open. Click here to check info on the location, parking, cosplay weapons & harassment policies and more. Our Guest List - we've added a ton of great guests that you may have missed so check it out! Our Programming Schedule - over 30 hours of great panels all capped off with our 1st Annual Cosplay Revolution Contest! 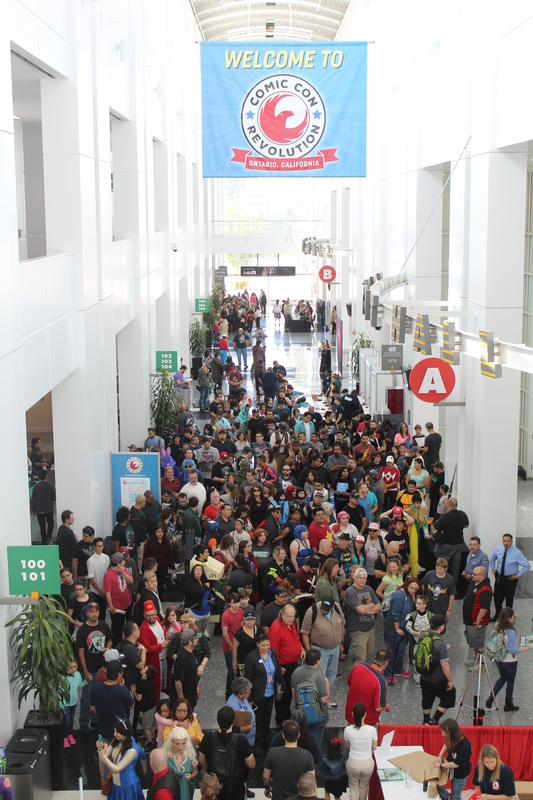 Our show floor is packet with artists, writers, art, comics, cosplay, toys, games and more. Check out our Artist Alley List and Exhibitor List to see who will be there! Want to download a PDF of our program book in advance? Just click here and plan ahead! Keep an eye out here on our website and our Facebook, Twitter and Instagram for updates throughout the week. Don't be shy - post on social media (don't forget to tag us). Be an active part of the Comic Con Revolution! The official tag for the day is #CCROnt and don't forget to use our custom Snapchat geofilter when posting those awesome snaps! Here we are, only 10 days until the big day. We're buttoning up the last details and prepping to make Comic Con Revolution one heckuva day. We've got more amazing guests than you can shake a pencil at, a packed exhibit hall, a full day of panels and programming all set for you to enjoy. We have so much going on that we bet you are asking yourself "How can I make sure I don't miss anything?" We've got just the thing - an advanced look at our Program Guide. You can download a digital copy of our program guide early and plan ahead. Just click here and get crackin'. COMIC CON REVOLUTION IS LESS THAN 2 WEEKS AWAY! What's up Inland Empire? Happy First Day of May! With less than two weeks until the launch of the inaugural Comic Con Revolution - May 13th at the Ontario Convention Center - we are still hard at work putting the finishing touches on what is sure to be a jam-packed fun filled day! Our guest list has more than 30 of some of the top comic book creators in the world, including legends Whilce Portacio & Jim Starlin. We have comic artists and writers from Marvel, DC, Top Cow, Image, IDW and more! Our show floor is packed top comic book talent like Todd Nauck, Paolo Rivera, Chris Bachalo, Tim Bradstreet, Dennis Hopeless, Matthew Clark and Ron Marz, just to name a few. Over in our Guest Area you can meet David Naughton, the star of An American Werewolf in London and Mighty Morphin Power Rangers' Rita Repulsa Carla Perez. Or stop by Booth 219 to meet horror movie star Bill Moseley. Video game fans can meet the voices of the smash hit Overwatch & other games in Booth 504 at CCR Ontario. Anjali Bhimani (Symmetra), Feodor Chin (Zenyatta) and Josh Petersdorf (Roadhog) will be signing autographs and taking pics with fans. Artist Alley features a variety of super talented people ranging from crafters, fan artists, indie publishers, creators on your fave books to legends of the comics industry. Check out our Cosplay Corner to pose for pics with some amazing local cosplayers or meet our cosplay guests Vivid Vivka and Raychul Moore. Watch as cosplayers compete for cash & prizes in our Cosplay Revolution Cosplay Contest sponsored by Dave & Buster's and hosted by Angi Viper & DeadFNPool. Star Wars costume & fan groups The 501st Legion, Mandalorian Mercs and the SaberGuild will also be on hand for the fun and festivities! If you're a wrestling fan be sure to stop by Booth 513 to meet Lucha Underground's Marty Casaus aka Marty the Moth and Karlee Perez aka Katrina. 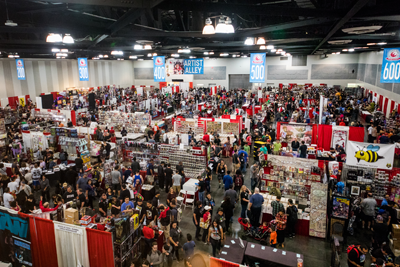 Hit up our Dealer & Exhibitor floor to find some of the coolest pop culture stuff out there or fill in the holes in your comic collection shopping at one of our awesome dealers. Get the inside scoop on your favorite stuff in one of our fun and entertaining panels. We have packed 30 hours of programming into one day. *Limit 2 kids free per paid adult. Check-in for online ticket holders opens at 7:30am. LEGENDARY COMIC CREATOR JIM STARLIN JOINS THE REVOLUTION! It's just 17 days from the inaugural Comic Con Revolution and we've just added another amazing guest! We are very excited to tell you legendary comic creator Jim Starlin is making the trip from the Empire State to the Inland Empire to be a part of the movement. The creator of Thanos, Jim is best known for his outer space adventures including his long run on the Silver Surfer, killing off Captain Marvel and the battle over The Infinity Gauntlet that inspired the upcoming Avengers movies. Look for Jim in our Artist Alley when the Revolution comes to the Ontario Convention Center - May 13th. VOICES OF THE REVOLUTION! YOUR FAVORITE VIDEO GAME VOICE ACTORS ARE COMING TO CCR! Game On! Are you a gamer? Well, do we have some fun planned for you! The voices of the hit video game Overwatch are coming to Comic Con Revolution! Anjali Bhimani (Symmetra), Feodor Chin (Zenyatta) and Josh Petersdorf (Roadhog) will all be joining us at the Ontario Convention Center on May 13th. They will be in Booth 504 on our show floor meeting fans, signing autographs and taking pics. You can also get a behind the scenes look into the making of video games at their Voices From Your Favorite Game panel at 1:30pm in panel room 104B. Be sure to add that to your con schedule! COMIC LEGEND WHILCE PORTACIO HAS JOINED THE CAUSE! With less than a month to go until Comic Con Revolution invades the Inland Empire and the buzz is building! One of the guests people are most excited to see is long time fan favorite artist Whilce Portacio. Starting his career as an inker on Marvel's Alien Legion in 1984 and Art Adam's Longshot mini-series, his work as the penciller on The Punisher, X-Factor, and The Uncanny X-Men, for which he co-created the character Bishop, quickly turned him into a fan favorite. In 1992 Whilce was part of the group of top creators who co-founded Image Comics and later published his Wetworks through Jim Lee's Wildstorm imprint, as well as a run on Spawn with Todd McFarlane returning as co-writer. We are very happy to have Whilce joining us for the debut Comic Con Revolution. You will be able to find him in our Artist Alley at Table J1. PROLIFIC COMIC WRITER RON MARZ IS JOINING THE RANKS OF THE REVOLUTION! We've added another great guest to the ever growing guest list for the inaugural Comic Con Revolution this May 13th in Ontario California. We are pleased to announce that Ron Marz will be joining the revolution! Marz, a longtime industry veteran, has worked for every major comic company in his career. Most notably he is known for his work on the Ominous Press titles, Green Lantern, Witchblade and as a founding creator at Crossgen Comics. Make sure to stop by and catch up with Marz while you are at the show. You can find him in artist alley at Table D8 all show long. That's right -- Chris Bachalo is coming to Comic Con Revolution this May 13th to join the revolution! A legend and fan favorite in the industry, Bachalo is known for his iconic work on Shade: The Changing Man, Sandman, Death, X-Men and, most recently, Dr. Strange. He is making a very rare appearance at the show so be sure to bring your books for him to autograph. Bachalo is the latest addition to our ever growing guest list for Comic Con Revolution. We've got a diverse guest list that is sure to be a highlight of the show. Add in a full exhibitor floor including over 100 creators in artist alley as well as a full day of programming and we are set to kick of the summer convention season in style. SUPER VILLAIN INVADES ONTARIO! POWER RANGERS STAR JOINS THE REVOLUTION! BIG NEWS! Mighty Morphin Power Rangers' Rita Repulsa - Carla Perez will be appearing at Comic Con Revolution May 13th at the Ontario Convention Center. Best known for her role as the evil sorceress, Rita Repulsa on Mighty Morphin Power Rangers TV series, Carla began her career portraying Rita Repulsa back in 1993 to present day. She has all together appeared in 75 episodes over several seasons which include: Mighty Morphin Power Rangers, Power Rangers Zeo, Power Rangers in Space and Power Rangers DinoThunder. She also portrays Rita in Turbo:A Power Rangers Movie, Mighty Morphin Power Rangers-Ninja Quest (Video) and Lord Zedd's Monster Heads: The Greatest Villains of the Mighty Morphin Power Rangers (Video short). She also had a recurring role on the V.R. Troopers TV Series as Ziktors Beauty. Carla is also the president of MC Tech. Serv., loves technology and has a degree in computer programming. Her most recent project was portraying Rita Repulsa in Adi Shankar and Joseph Kahns internet viral sensation, Power/Rangers (reboot), a short sci-fi film. THE COMIC CON REVOLUTION TEASER REEL IS HERE! Check out what we have in store for you this May!